Refractory glaucoma with uncontrolled intraocular pressure (IOP) is managed with tube-shunt surgery or cyclodestructive procedure., Cyclodestructive procedures damage the secretory epithelium of the ciliary body, which reduces aqueous secretion and decreases IOP. Traditionally, these procedures, including cyclophotocoagulation, have been used primarily for pain management in patients with end-stage disease and no remaining vision. However, with the advent of endoscopic cyclophotocoagulation (ECP), complication rates have significantly decreased, and indications for cyclophotocoagulation have remarkably expanded. Traditional cyclodestructive procedures, such as cyclocryotherapy and transscleral cyclophotocoagulation, can reduce IOP. However, they both carry a significant risk of marked inflammation, hypotonia, and to a lesser extent phthisis.,,,, ECP is a more recent less invasive technique and is used to treat glaucoma.,, While meta-analyses have shown no significant difference in the clinical efficacy of ECP in comparison to non-ECP techniques, ECP is far more expensive., In addition, ECP is potentially associated with a decreased risk of postoperative complications compared with transscleral cyclophotocoagulation. However, the difference in safety and long-term complications remains to be fully evaluated. Our institutional review board and ethics committee approved the study, and informed consent was obtained from each patient. Patients with a history of refractory glioma were prospectively recruited. The patients [n = 11, [Table 1]] underwent preoperative assessments of visual acuity, IOP, slit-lamp examination, ophthalmofundoscopy, B-ultrasound and ultrasound biomicroscopy, optical coherence tomography, and fundus fluorescein angiography, if dioptric media permitted. Patients who were deemed to be surgical candidates and consented to the procedure were treated with cyclophotocoagulation with an illuminated laser probe under a noncontact wide-angle retinoscope. All procedures were carried out by a single surgeon. Patients were administered retrobulbar or general anesthesia. If vitrectomy was required due to vitreous hemorrhage or diabetic retinopathy, the patient initially received a conventional 23G/25G three-channel vitrectomy. 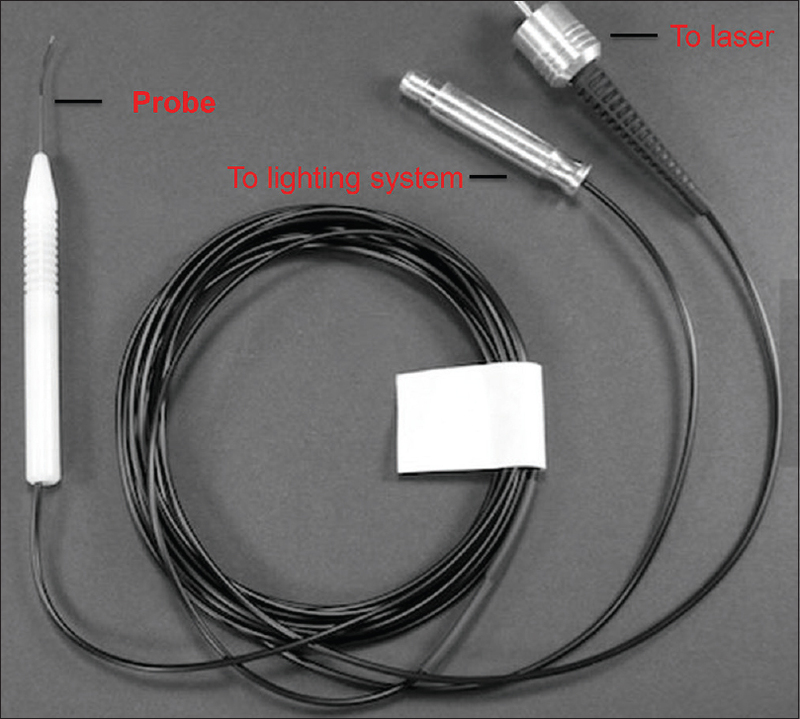 Cyclophotocoagulation with an illuminated probe under a noncontact wide-angle retinoscope was carried out with a trocar placed above the nose or temporalis. A 23G/25G single-channel trocar was placed 3.5–4.0 mm above the posterior edge of the cornea in patients not requiring a vitrectomy. Cataract surgery was performed first if needed. All procedures were completed using a noncontact wide-angle retinoscope. The surgeon used a constant pressure device to push the sclera upward to expose the ciliary body with one hand and photocoagulated the crown of the ciliary body using the probe with the other hand [Figure 1]. If the photocoagulation scope was over 180°, another 23G/25G trocar was placed 3.5–4.0 mm posterior to the corneal limbus, forming a 90° angle with the first trocar. 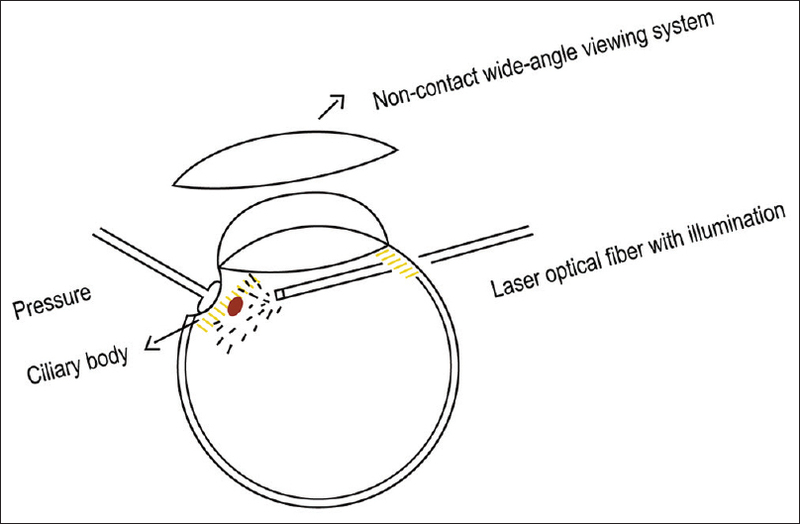 The illuminated laser probe (Synergetics®, Bausch and Lomb, Inc., St. Louis, MO, USA) is an optical fiber with integrated lighting and laser functions and can be connected to various lasers and vitrectomy lighting systems [Figure 2]. The laser was set to 150–300 mW (532 nm, VISULAS 532s; Zeiss, Germany) and pulsed at intervals ranging between 0.3 and 0.5 s. Photocoagulation was performed after the focus point was adjusted to the ciliary process and was carried out on both the anterior and posterior portions of the ciliary process. The distance of photocoagulation from the ciliary processes was 2–3 mm. The optimal photocoagulation resulted in the ciliary process turning white, collapsing, and wrinkling. 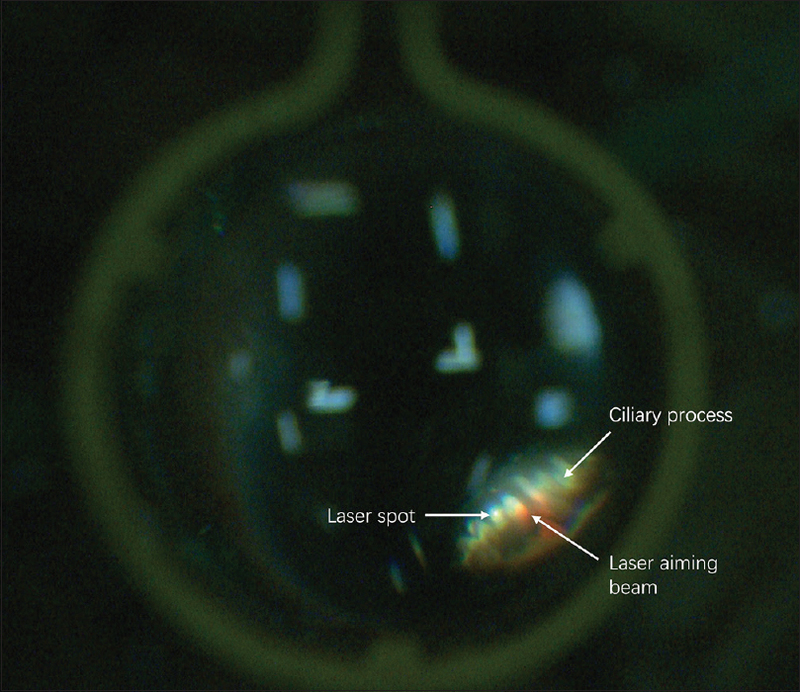 The intensity of the laser was adjusted depending on the reaction of the ciliary body to the first attempt of photocoagulation. If the ciliary process bulged after being treated or a “pop” sound was heard, the laser intensity and/or photocoagulation time was decreased, or the distance between the laser and the ciliary process was increased. The laser intensity and photocoagulation time were increased if the ciliary process did not appear to react to the treatment. The degree of photocoagulation ranged between 180° and 360° continuously [Figure 3]. However, this was adjusted according to the preoperative IOP, any preexisting conditions, or any complications that were encountered during the surgery. If vitrectomy was performed simultaneously, gas–liquid exchange and intraocular tamponade were carried out after photocoagulation. Then the trocars were withdrawn, and the portals were closed using the 8-0 suture. The patients were followed up monthly for 7–12 months. If dioptric media permitted, optical coherence tomography was performed four times postoperatively at 1 day, 1 week, 3 weeks, and 6 weeks. Following the procedure, the patients received local corticosteroids, nonsteroidal anti-inflammatory drugs, and antibiotic eye drops. These drugs were discontinued once inflammation of the anterior chamber and vitreous body subsided. During the postoperative 1 week, oral prednisone of 30 mg was administered once daily. An IOP-lowering agent was also used for patients with an elevated IOP. The preoperative medications were continued postoperatively with adjustments based on the IOP. Data were analyzed using SPSS software, version 16.0 (IBM Corporation, Chicago, Illinois, USA). Statistical significance of difference in IOP was calculated by two-tailed t-test. A P value less than 0.05 was considered statistically significant. Eleven patients (11 eyes), including eight males and three females age 48–70 years (mean 59 years), with refractory glaucoma were successfully treated [Table 1]. Previous treatments include simple vitrectomy in three patients (27%), phacoemulsification with vitrectomy in five patients (45%), and phacoemulsification with implantation of an intraocular lens in 1 patient (9%). The primary cause of neovascular glaucoma (NVG) was diabetic retinitis in nine patients (81.8%) and central retinal vein occlusion in two patients (18%). Nine patients received retrobulbar anesthesia and two patients received general anesthesia for the procedure. The mean immediate preoperative IOP was 51.9 mmHg (range 45–58 mmHg). The mean IOP decreased significantly to 27.1 mmHg at 1 month (range 16–33 mmHg), 20.6 mmHg at 3 months (range 14–28 mmHg), 18.5 mmHg at 6 months (range 14–28 mmHg), and 18.8 mmHg at the last follow-up visit (15–24 mmHg). The mean final decrease was 68.2% [Table 2]. Four patients used IOP-lowering agents postoperatively, and their IOP ranged between 16 and 21 mmHg. Another four patients did not require the use of IOP-lowering agents, and none of them experienced ophthalmalgia, headache, or other symptoms. The remaining three patients had an IOP between 22 and 24 mmHg at the last follow-up visit despite the use of IOP-lowering agents both before and after the procedure. Different degrees of inflammatory reactions were observed. Fibrotic exudates were visible in the pupils of two patients (18.2%) and were absorbed within 1 week. Anterior chamber hyphema appeared postoperatively in three patients (27.3%) and was absorbed 5 days postoperatively. Exudative choroidal detachment occurred in one, and full restoration was achieved in 7 days. At the late stage of follow-up, no patients had intraocular lens deviation or dislocation, hypotonia oruli, atrophy of the eyeball, retinal detachment, end ophthalmitis, or sympathetic ophthalmia. Argon laser ablation of the ciliary processes can be applied with an endophotocoagulation probe under direct visualization of the ciliary processes by sclera depression. The greatest challenge with this procedure is that the ciliary processes are difficult or impossible to view in vivo except under these unique circumstances., Experience with the transvitreal route of ciliary process ablation is limited, and vitrectomy and lensectomy are prerequisites for this method. As viewed through the operating microscope in a low-pressure eye, the endophotocoagulation probe is inserted through a pars plana sclerotomy site. The surgeon's other hand indents the sclera, pushing the ciliary processes into view in the papillary space and allowing for microscopic visualization during photocoagulation. This technique, however, is extremely difficult and requires a clear cornea, a low-pressure eye, a widely dilated pupil, and a highly skilled surgeon.,, The 810 diode red laser is used for transscleral photocoagulation of the ciliary process, whereas the 532 green laser is used for photocoagulation of the ciliary process under naked eyes. Intraocular drainage device implants and cyclophotocoagulation are the most common clinical interventions. With the development of ophthalmoendoscopy and laser techniques, ECP has become one of the main treatment modalities for refractory glaucoma. ECP is both safe and effective,,,,,, but also has some limitations. The ophthalmoendoscope system is expensive without stereo perception and has a long learning curve for operators. In our study, we propose a modified technique for ciliary body photocoagulation with an illuminated laser probe under a noncontact wide-angle retinoscope. This technique achieved an average decrease of 68.2% in IOP. Surgical visualization is obtainable directly through a noncontact wide-angle retinoscope in which the ciliary body can be exposed by slightly pressing against the sclera, and cyclophotocoagulation can be completed directly through the 23G/25G single channel for patients who do not need to undergo vitrectomy. Our technique delivers results with stereo perception. Cyclophotocoagulation can be implemented during vitrectomy, which can be done through 23G/25G channel. Our technique has a more stereo vision than ECP and therefore is easier to learn. In addition, our technique requires less equipment than ECP. Therapeutic interventions of NVG remain a challenge as current treatment options have shown varying degrees of success rates and high incidences of complications. Our modified technique of cyclophotocoagulation is safe and effective for reducing IOP. Compared with ECP, our technique is less dependent on special equipment and surgeon skills. QYY and BC participated in conception and design, performed experiments, collected and assembled data, involved in data analysis, interpretation, and article writing. JH and LSC performed experiments and collected data. ZSB contributed to data analysis and interpretation. All authors approved the final version of the article. This study was supported by the Natural Science Foundation of Ningbo City. (2017A610237), and Zhejiang Medical and Health Science and Technology Program (2017KY619, 2018KY735). Sidoti PA. Inferonasal placement of aqueous shunts. J Glaucoma 2004;13:520-3. Francis BA, Kawji S, Vo NT, Dustin L, Chopra V. Endoscopic cyclophotocoagulation (ECP) in the management of uncontrolled glaucoma with prior aqueous tube shunt. J Glaucoma 2011;20:523-7. Bras D, Maggio F. Surgical treatment of canine glaucoma: Cyclodestructive techniques. Vet Clin North Am Small Anim Pract 2015;45:1283-305. Pastor SA, Singh K, Lee DA, Juzych MS, Lin SC, Netland PA, et al. Cyclophotocoagulation: a report by the American Academy of Ophthalmology. Ophthalmology 2001;108:2130-8. Ekici F, Waisbourd M, Katz LJ. Suppl 1: M4: Current and future of laser therapy in the management of glaucoma. Open Ophthalmol J 2016;10:56-67. Caprioli J, Strang SL, Spaeth GL, Poryzees EH. Cyclocryotherapy in the treatment of advanced glaucoma. Ophthalmology 1985;92:947-54. Brancato R, Giovanni L, Trabucchi G Pietroni C. Contact transscleral cyclophotocoagulation with Nd: YAG laser in uncontrolled glaucoma. Ophthalmic Surg 1989;20:547-51. Hawkins TA, Stewart WC. One-year results of semiconductor transscleral cyclophotocoagulation in patients with glaucoma. Arch Ophthalmol 1993;111:488-91. Shields MB, Shields SE. Noncontact transscleral Nd:YAG cyclophotocoagulation: A long-term follow-up of 500 patients. Trans Am Ophthalmol Soc 1993;92:271-83. Uram M. Endoscopic cyclophotocoagulation in glaucoma management. Unfallchirurgie 1995;6:19. Yang Y, Zhong J, Dun Z Liu XA, Yu M. Comparison of efficacy between endoscopic cyclophotocoagulation and alternative surgeries in refractory glaucoma: A meta-analysis. Medicine 2015;94:e1651. Siegel MJ, Boling WS, Faridi OS, Kim C, Boling RC, Citron ME, et al. Combined endoscopic cyclophotocoagulation and phacoemulsification versus phacoemulsification alone in the treatment of mild to moderate glaucoma. Clin Exp Ophthalmol 2015;43:531-9. Awh CC, Schallen EH, Jr DJE. An illuminating laser probe for vitreoretinal surgery. Arch Ophthalmol 1994;112:553-4. Lin SC. Endoscopic and transscleral cyclophotocoagulation for the treatment of refractory glaucoma. J Glaucoma 2008;17:238. Inoue M. Wide-angle viewing system. Dev Ophthalmol 2014;54:87. Chalam KV, Gupta SK, Agarwal S. Illuminated curved vitrectomy probe for vitreoretinal surgery. Ophthal Surg Lasers Imag 1900;38:525-6. Patel A, Thompson JT, Michels RG, Quigley HA. Endolaser treatment of the ciliary body for uncontrolled glaucoma. Ophthalmology 1986;93:825-30. Abe RY, Tavares CM, Schimiti RB, Vasconcellos JP, Costa VP. Ahmed glaucoma valve implantation for refractory glaucoma in a tertiary hospital in Brazil. J Ophthalmol 2015;2015:1-7. Olmos LC, Lee RK. Medical and surgical treatment of neovascular glaucoma. Int Ophthalmol Clin 2011;51:27-36. Tsai JC, Feuer WJ, Grajewski AL. 5-Fluorouracil filtering surgery and neovascular glaucoma. Long-term follow-up of the original pilot study. Ophthalmology 1995;102:892-3. Samples JR, Singh K, Lin SC, Francis BA, Hodapp E, Jampel HD, et al. Laser trabeculoplasty for open-angle glaucoma: A report by the American Academy of Ophthalmology. Ophthalmology 2011;118:2296. Agarwal HC, Sihota R, Das C, Dada T. Role of argon laser trabeculoplasty as primary and secondary therapy in open angle glaucoma in Indian patients. Br J Ophthalmol 2002;86:733. Vijaya L, Manish P, Ronnie G, Shantha B. Management of complications in glaucoma surgery. Indian J Ophthalmol 2011;59:S131. Chalam KV, Gandham S, Gupta S, Tripathi BJ, Tripathi RC. Pars plana modified Baerveldt implant versus neodymium: YAG cyclophotocoagulation in the management of neovascular glaucoma. Ophthal Surg Lasers 2002;33:383-93. Zarbin MA, Michels RG, De BS, Quigley HA, Patel A. Endolaser treatment of the ciliary body for severe glaucoma. Ophthalmology 1988;95:1639-48. Charles S. Endophotocoagulation. Retina 1981;1:117-20. Berke SJ. Large study supports Combination phaco-ECP. Ophthalmol Times 2007. Lindfield D, Ritchie RW, Griffiths MF. “Phaco-ECP”: Combined endoscopic cyclophotocoagulation and cataract surgery to augment medical control of glaucoma. BMJ Open 2012;2:e000578. Clement CI, Kampougeris G, Ahmed F, Cordeiro MF, Bloom PA. Combining phacoemulsification with endoscopic cyclophotocoagulation to manage cataract and glaucoma. Clin Exp Ophthalmol 2013;41:546-51.